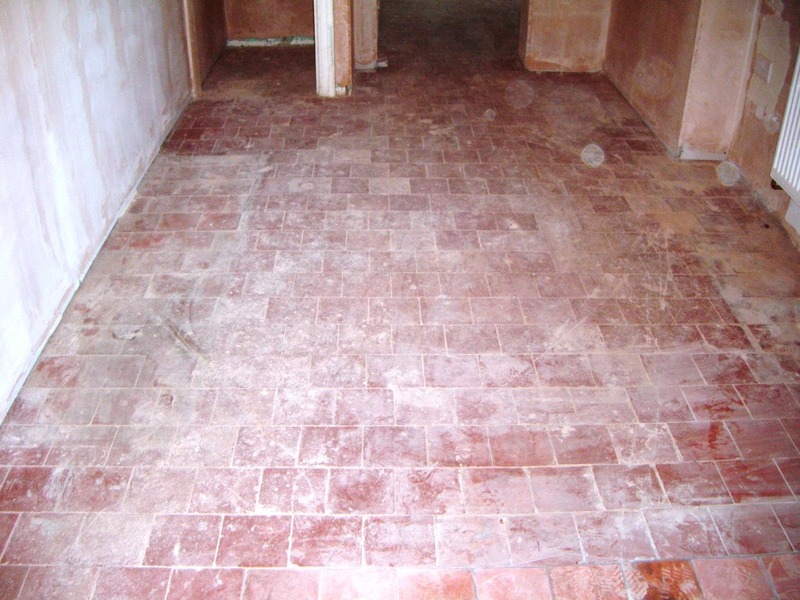 This Quarry tiled floor was at a house in the town of Market Harborough and as you can see from the photograph below it was in a right state due to the plastering that had gone on previously while the property was refurbished. The plasterer has taken no steps to protect the tiles and as a result there was plaster and plaster dust ingrained into the tile. To clean the floor and remove mess of plaster that it has become covered it the whole floor was soaked in a strong dilution of Tile Doctor Remove and Go which is a strong coatings remover that is safe to use on tile, stone and grout. If was left to dwell on the tiles for around twenty minutes before being worked into the floor with a rotary machine fitted with a black scrubbing pad, the grout was also scrubbed but this needs to be done by hand with a stiff brush. 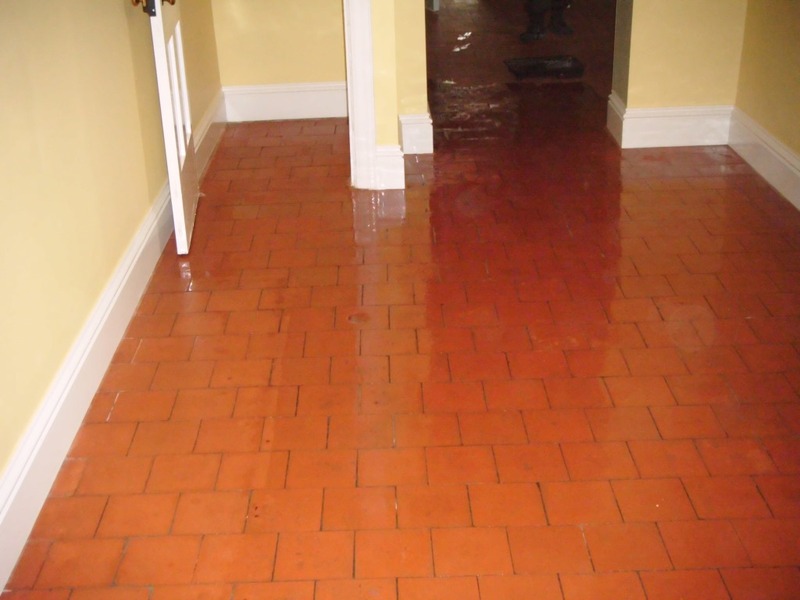 The soiled cleaning solution is then rinsed away using a wet vacuum and the process repeated on stubborn areas until all the tiles were clean. Once I was happy the floor was in an acceptable condition it was thoroughly rinsed with water to remove any cleaning products that might upset the sealer and then left to dry overnight; the wet vacuum was used again to remove the water and help dry the floor. We delayed our return until the decorators had painted the walls and unlike the plasterers they protected the floor so we didn’t have to spend time removing paint from the tiles. The tiles were thoroughly dry when we returned and so we got straight on with the task of sealing them with five coats of Tile Doctor Colour Grow which is an impregnating sealer that occupies the pores in a tile preventing contaminates from become ingrained and as its name suggests does a great job of enhancing the colour in the tile. This entry was posted in Stone Sealing Products, Tile and Stone Problem Solvers, Tile Cleaning Products and tagged cleaning services, floor maintenance, floor restoration, Leicestershire, market harborough, Quarry Tiles, quarry tiles restoration, sealing quarry tiles, tile cleaning, tiled floor by AbzDominise. Bookmark the permalink. The Quarry tiles and room looks transformed, would love to have seen it with furniture in.